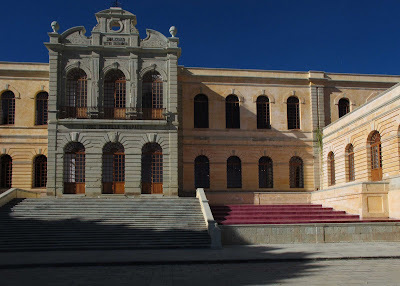 San Agustín Etla is a town located in a picturesque canyon in the foothills of the Sierra de San Felipe seventeen miles north of the city of Oaxaca. The town hosts a lively Day of the Dead celebration each November 1. 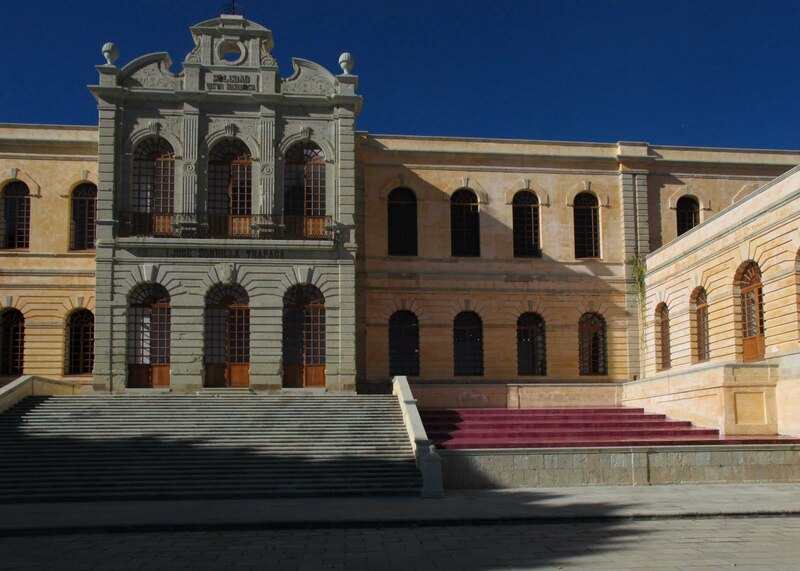 It is the home of El Centro de las Artes San Agustín Etla, also known as CASA. Founded by Francisco Toledo, CASA is committed to education, artistic creation and experimentation, and as a public space. CASA is a former spinning and weaving factory founded in 1883 by José Zorrilla Trápaga for manufacturing raw cotton yarns, blankets, and denim fabrics. It was located here due to the abundant water from the San Felipe. Power came from a small hydroelectric plant. After being abandoned in the eighties, Francisco Toledo purchased this property in 2000 in order to create the first eco-arts center in Latin America. Architect Claudina Morales Lopez designed the space and it was funded through the National Center for the Arts (CENART), the State Government, and private foundations including the Harp Helú Foundation and Friends of the IAGO. CASA opened its doors on March 21, 2006. Today CASA is comprised of a set of spaces providing for artistic initiation and creation. It has spaces equipped for the production of digital graphics, traditional graphic and dyeing workshops and textile design, photographic developing and organic printing. CASA offers the public a library of over three thousand volumes. Under the assumption that the interaction with people from different lands stimulates creativity, promotes tolerance and strengthens a community, CASA invites artists to perform residencies giving priority to projects of ecological and community care. 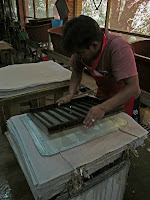 This post focuses on the architecture of CASA and the paper making workshop as well as some past exhibitions of art paper. In the future I will try to cover other exhibitions, including one of Jorge Wilmot. 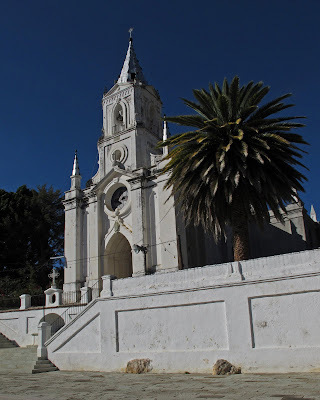 San Agustín Etla also has a fine hike from town up the valley along the aqueduct for about 3 miles ending at a small abandoned hydroelectric plant and the start of the aqueduct. First let’s make some paper. 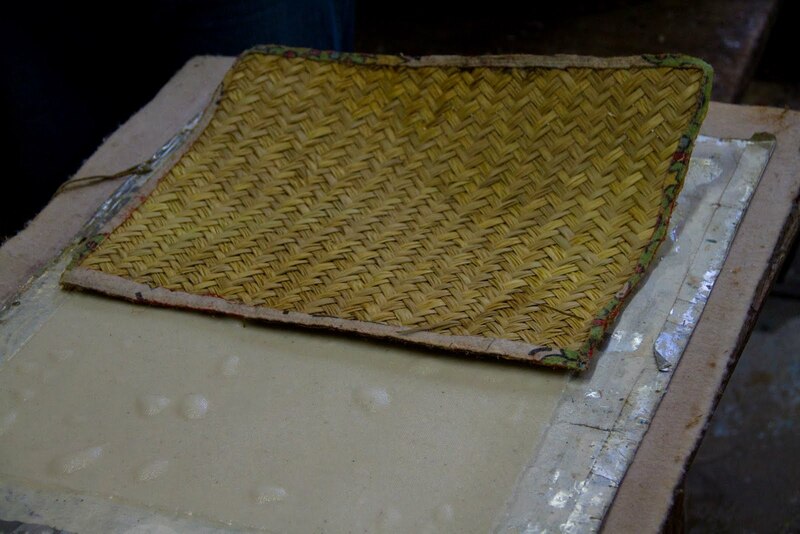 The small workshop makes art papers from natural fibers indigenous to Oaxaca. 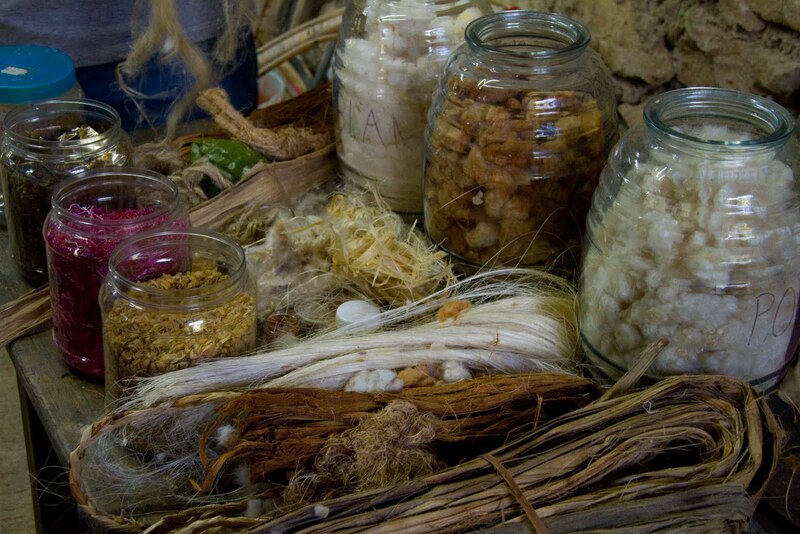 On the table you can see several different cottons in the tall jars, hemp and sisal in front, and in the short jars mica in back, flower stamens in the middle and probably another dried flower in front. 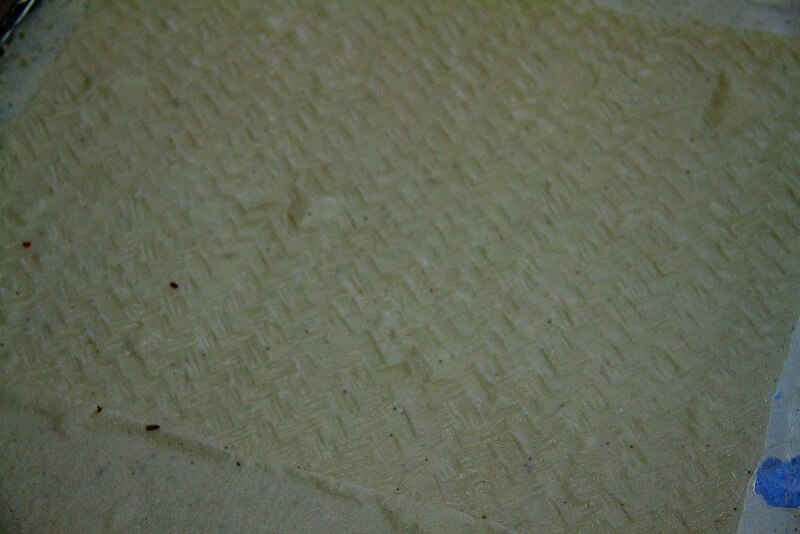 The fibers are cooked in a mash with bicarbonate of soda for a few hours or up to a week depending on the durability of the fiber. Cotton is the quickest. 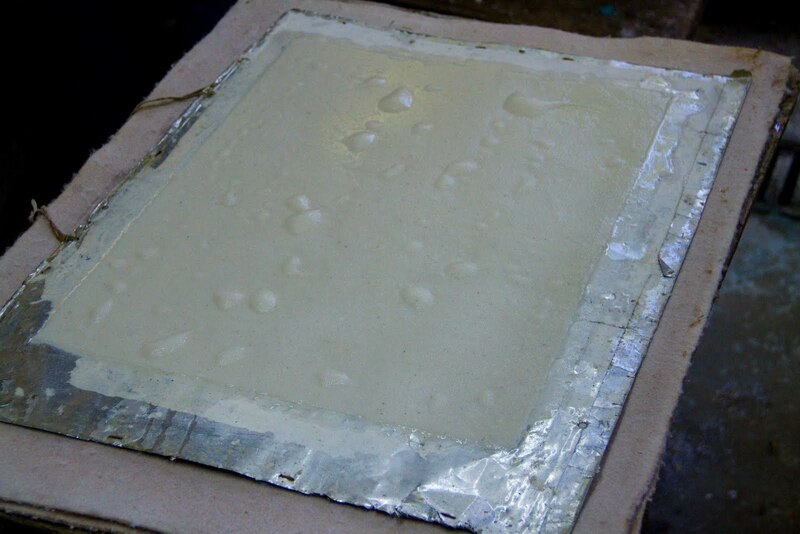 To make a sheet of paper you dip a screen into the soup of fiber, drain it a bit then press it out between synthetic sheets of felt. 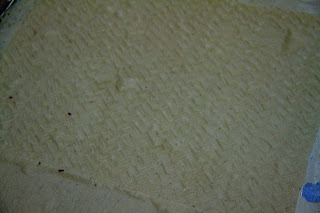 Various textures can be added using reed mats or even fingerprints. They make various items: paper jewelry, sketch books, and kites printed with designs by Toledo. For more photos please visit my online web album. For information on Casa link to their website http://casanagustin.org.mx/.